HOOD, ROBERT, naval officer, explorer, painter, and surveyor; b. c. 1797 probably in Portarlington (Republic of Ireland), second son of Richard Hood and Catherine Roe; d. unmarried 20 Oct. 1821 near Lake Providence (N.W.T.). Robert Hood came from an Anglo-Irish family. His father, a scholar and clergyman of some scientific ability, was probably responsible for Hood’s education. By 1803 the family was living in Bury St Edmunds, England, where Hood Sr had obtained a curacy. On 5 Feb. 1809 Hood joined the Royal Navy as a first-class volunteer. He served successively in the Baltic, off the Iberian peninsula, in the Mediterranean, in the English Channel, in an attack on Algiers in August 1816, and briefly on the Cape of Good Hope station. He had risen to able-bodied seaman in October 1810 and to midshipman in September 1811. At his examination for a lieutenancy in October 1816 Hood presented private logs, containing numerous drawings and water-colours depicting incidents of naval life, which the examining officers declared “journals which we have never seen surpassed.” Hood received a passing certificate but his promotion was not confirmed and he went on half pay. 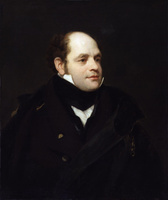 Following the Napoleonic Wars the British Admiralty turned its efforts to the discovery of a passage between the Atlantic and Pacific oceans through the North American Arctic, and in May 1819 Hood was appointed midshipman on an expedition to be led by Lieutenant John Franklin* overland from Hudson Bay. Its ultimate purpose was to chart the Arctic coast eastwards from the mouth of the Coppermine River (N.W.T.) to Chesterfield Inlet on Hudson Bay. Hood and George Back* were to take navigational, geographical, and meteorological observations, and make such “drawings of the land, of the natives, and of the various objects of natural history” as the second officer of the expedition, John Richardson*, might suggest. The expedition suffered from poor planning, unforeseen difficulties, and sheer bad luck. The party arrived at York Factory (Man.) on 30 Aug. 1819, having failed en route to hire a sufficient number of boatmen in the Orkney Islands, Scotland. The Hudson’s Bay Company, embroiled in bitter competition with the North West Company, was unable to make up the deficiency in men and boats, and consequently many supplies had to be left behind when the group, numbering 11, departed for Cumberland House (Sask.) on the Saskatchewan River, which it reached in October 1819. On 13 June 1820 Hood and Richardson set out to rejoin Franklin. In the Otter Rapids (Sask.) on the Missinippi (Churchill) River Hood risked his life in a futile attempt to save a canoe foreman who had been accidentally swept down. Hood did not record the incident, but Richardson did. From Fort Chipewyan the reunited expedition, reinforced by hired voyageurs and interpreters, advanced via Fort Providence (Old Fort Providence, N.W.T.) to Winter Lake, where, beginning in August 1820, it constructed Fort Enterprise. Back and Hood reconnoitred a route to the Coppermine for the following spring. The two men fell in love with a 15-year-old Copper Indian girl named Greenstockings and, had not an alert Hepburn surreptitiously removed the charges from their guns, they would have fought a duel over her. The dispatch of Back to obtain crucial supplies at Fort Chipewyan, 1,100 miles distant, prevented further incidents. Hood painted a portrait of Greenstockings, who gave birth to a daughter by him. That winter Hood worked intensely on his drawings, paintings, and observations, in the process weakening his health through lack of air and exercise. In June 1821 the expedition set out for the mouth of the Coppermine. It had for some time suffered from a severe shortage of provisions, a result of the rivalry between the HBC and the NWC, and continued to do so. From 18 July to 18 August the party of five Englishmen, eleven Canadians, two Indian hunters, and two Inuit (one of whom was Tattannoeuck) charted 675 miles of coastline never before seen by white men. Lack of food and the onset of winter forced it to halt at Point Turnagain on Dease Strait. Franklin chose to return to Fort Enterprise by way of Bathurst Inlet, the newly discovered Hood River, and the barren grounds, but this route proved far more difficult than could have been imagined. The trek over the barren grounds was made Indian file, the voyageurs taking turns at the head to break the snow, Hood in the gruelling second position directing their steps until, on 20 September, weakness forced him back. The group subsisted on small game and a lichen called rock-tripe, which unfortunately caused some, but especially Hood, to have diarrhea. Hood had volunteered to perform the “invidious task,” as Franklin put it, of issuing the food, and “always took the smallest portion.” On 7 October Franklin, Back, and the stronger voyageurs were forced to leave behind several men, including Hood, who were too weak to keep up the pace. Two had already been abandoned, and presumably had died, on the 6th. By the 18th Hood was nearing death from exhaustion, dehydration, and starvation, but his life was evidently ended instead by an Iroquois voyageur, Michel Terohaute, who seems to have shot him in the head on the 20th after a violent quarrel. Terohaute was subsequently executed by Richardson, who later suspected him of cannibalism. A devout Christian – he was reading Edward Bickersteth’s A Scripture help . . . at the moment he died – Hood was conscientious, hard-working, honest, self-effacing, stoical, and possessed of an inquiring, philosophical mind and a wry sense of humour. He may have lacked the physical strength to endure the strenuous conditions under which the expedition laboured, but overwork and self-deprivation had also weakened his ability to survive. Had he lived he might have achieved the fame and knighthood that awaited his colleagues. As it was, news of his promotion to lieutenant on 1 Jan. 1821 reached Franklin’s party some weeks after his death. In all 11 men had died on this first overland expedition sent out by the Admiralty. The survivors, who included all the Englishmen except Hood, brought back valuable information on the northwest and Arctic regions. Previously uncharted portions of the continent were mapped with great precision, in large part thanks to Hood; with “extraordinary talent” and “a degree of zeal and accuracy that characterized all his pursuits,” in Franklin’s words, he had made surveys as the party advanced and “protracted the route every evening on a ruled map.” He had been the first to conduct a careful magnetic survey of the northwest. Hood’s journal constitutes a well-written record of the travels, work, and tribulations of the expedition from 23 May 1819 to 15 Sept. 1820. It describes the flora, fauna, and geography of the land, and records observations on the climate, magnetic phenomena, and aurora borealis. There are notes on the transportation, hunting, and fishing techniques of the inhabitants, and on the physique, customs, and ways of the Inuit, Métis, and Indians, particularly the Crees. The journal formed the basis for part of Franklin’s Narrative of a journey to the shores of the polar sea in the years 1819, 20, 21 and 22, which was illustrated with eight engravings from Hood’s drawings, including the portrait of Greenstockings. Feeling that Hood’s observations on the aurora borealis presented “some new facts,” Franklin reproduced them in full in a second edition. Hood’s paintings of wildlife, particularly birds, are among the best of their time. Five winter birds painted at Fort Cumberland were until then unknown to ornithologists, and had his paintings been published on their arrival in London and the species named, Hood would have been credited with priority in their discovery. His memory is perpetuated by a flower, Phlox hoodii, or moss phlox; a sedge, Carex hoodii; an animal, Citellus tridecemlineatus hoodii, or 13-striped ground squirrel; and a river, the Hood, taken by the expedition on its tragic return. Robert Hood is the author of “Narrative of the proceedings of an expedition of discovery in North America under the command of Lieut. Franklin, R.N.” A manuscript copy is held at PABC, AA20/H76, and a microfilm copy at the Glenbow-Alberta Institute. It was published as To the Arctic by canoe, 1819–1821: the journal and paintings of Robert Hood, midshipman with Franklin, ed. C. S. Houston (Montreal and London, 1974), with reproductions of a silhouette of Hood and several of his paintings. Chapters four and five of the journal had already appeared as “Some account of the Cree and other Indians, 1819,” in Alberta Hist. Rev. (Edmonton), 15 (1967): 6–17. Five engravings from sketches done by Hood in 1809, 1811, and 1812 aboard the Melpomene and Imperieuse were published in James Ralfe, Naval chronology of Great Britain . . . (London, 1820). The journals he kept on the Imperieuse and the Spey are in the possession of the Birch family of Surrey, B.C. Many of Hood’s sketches and water-colours have survived. They are mainly in private collections, and the greater part of them are still in the hands of his family. Six water-colours done during the Franklin expedition are held at the PAC and are reproduced in black and white in W. M. E. Cooke, W. H. Coverdale Collection of Canadiana: paintings, water-colours and drawings (Manoir Richelieu collection) (Ottawa, 1983). J.-R. Bellot, Memoirs of Lieutenant Joseph René Bellot . 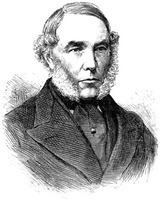 . . with his journal of a voyage in the polar seas, in search of Sir John Franklin, [ed. Julien Lemer] (2v., London, 1855). John Franklin, Narrative of a journey to the shores of the polar sea in the years 1819, 20, 21 and 22 . . . (London, 1823). HBRS, 1 (Rich). John Richardson, Arctic ordeal: the journal of John Richardson, surgeon-naturalist with Franklin, 1820–1822, ed. C. S. Houston (Kingston, Ont., and Montreal, 1984). G.B., ADM, Navy list, 1805–22. W. R. O’Byrne, A naval biographical dictionary: comprising the life and services of every living officer in her majesty’s navy . . . (London, 1849). R. E. Johnson, Sir John Richardson: Arctic explorer, natural historian, naval surgeon (London, 1976). Paul Nanton, Arctic breakthrough; Franklin’s expeditions, 1819–1847 (Toronto and Vancouver, 1970). L. H. Neatby, The search for Franklin (Edmonton, 1970). CHR, 66 (1985): 588–89. A. G. E. Jones, “Lieutenant Robert Hood, R.N., 1797–1821,” Musk-Ox (Saskatoon, Sask. ), no.16 (1975): 67–68. Jim Burant, “HOOD, ROBERT,” in Dictionary of Canadian Biography, vol. 6, University of Toronto/Université Laval, 2003–, accessed April 26, 2019, http://www.biographi.ca/en/bio/hood_robert_6E.html.